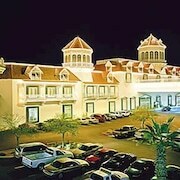 Located at the California-Nevada state line, this hotel and casino is 35 miles from downtown Las Vegas. Situated in Shoshone, this hotel is steps from Dublin Gulch and The White Trail. Shoshone Pond is 0.3 mi (0.5 km) away. Which hotels are closest to the Baker airport? Where to stay near top Baker attractions? Which hotel chains are in Baker? Visitors can enjoy all that Baker has to offer including its parks. Those planning a visit to the city can also enjoy things to do in the larger area. 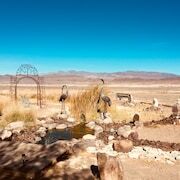 A couple of favorite places to visit are Sandy Valley Ranch and Death Valley National Park. Additionally, you can explore the sights and enjoy the activities in the larger area. As you plan your holiday getaway in Baker, you might not find the perfect accommodations in the city center, but below are lodging choices around the area. Buffalo Bill's Resort & Casino is 47.6 mi from the center of Baker. 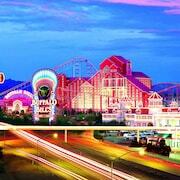 This 2.5-star resort in Primm features a casino, 7 restaurants, and free WiFi. Our customers like its overall value and proximity to shopping. Gold Strike Hotel & Gambling Hall is 52.3 mi from central Baker. Guests who stay at this 3-star hotel in Jean can enjoy access to a casino and 2 restaurants, along with free WiFi. Our customers like its dining options and clean, comfortable rooms. 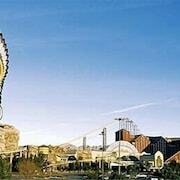 Primm Valley Resort & Casino is located 47.5 mi from the heart of Baker. 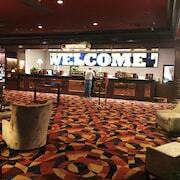 This 2.5-star resort in Primm features a casino, 5 restaurants, and free WiFi. 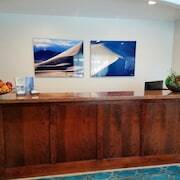 It's a favorite with Expedia travelers for its bar and overall value. Are there hotels in cities near Baker? Explore Baker with Expedia.com.au’s Travel Guides to find the best flights, cars, holiday packages and more!